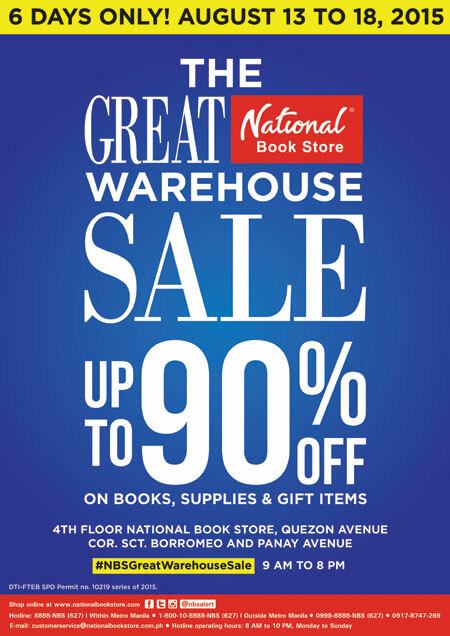 National Book Store holds The Great Warehouse Sale at its Quezon Avenue branch on August 13-18, 2015 at 9am to 8pm. Up to 90% discount on books, school supplies and gift items. I have been a certified fan of this kind of warehouse sale of National Bookstore. This shouldn't be missed! I bought too many books from their warehouse sales held at SM Southmall (Las Piñas City) and SM Molino (Cavite City) in 2014. I missed out the other schedules at other branches. Just to give you an example: for PhP1,000, you can have 1-2 boxes FULL of books! What can you say about that? Address: 4/F National Book Store, Quezon Avenue corner Sct. Borromeo and Panay Avenue, Quezon City. 9am-8pm.